Formed millions of years ago by the tremendous force of an underground river cutting through solid limestone rock, the Olentangy Indian Caverns today offer an exciting excursion into ancient Indian lore with a maze of beautiful winding passages and spacious underground rooms. There is evidence that the Wyandotte Indians used these caverns as a haven from the weather and from their enemies, the Delaware Indians. 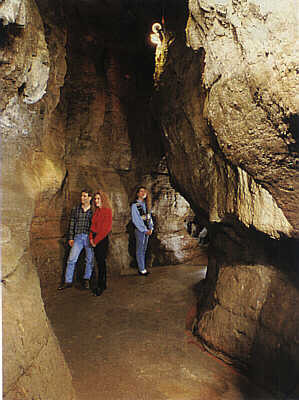 One of the large rooms contains "Council Rock" (see cover), used by the Wyandottes for tribal ceremonies, The first white man believed to have entered the caverns was J. M. Adams, a member of a westbound wagon train that camped nearby in 1821. During the night one of his oxen broke loose and wandered off. In the morning the ox was found dead at the bottom of the entrance to the ancient Indian cavern. After exploring the entrance, Adams carved his name and date on the wall, where it can be seen to this day. 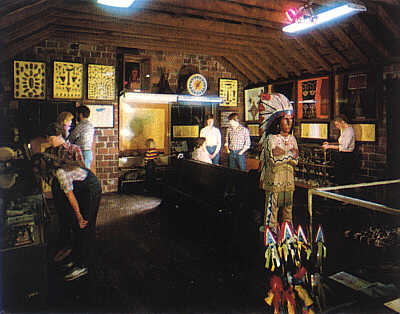 Various artifacts found in the caverns indicate that the Indian Council Room was used by Wyandotte braves for making arrows and other stone implements until as late as 1810. Hundreds of these items were found when the caverns were opened and some are on display in the Museum. "Leatherlips," the chief of the Wyandottes, was killed at the entrance to the cavems by his own people. This remarkable geological wonder is now accessible to everyone from the picturesque Cave House atop the entrance. Concrete stairways descend 55 feet to the maze of natural passages and rooms oc cupying three different levels. The second level contains "Indian Lover's Bench," "Battleship Rock" and "The Crystal Room." "Fat Man's Misery" is a quaint passage leading to "Cathedral Hall" and "The Bell Tower" room 105 feet below the earth's surface. Beyond are passages and rooms still unexplored. A fourth level where an underground river is flowing to the Olentangy River, a half mile east, has been partially explored but not opened to the public. It is known that the river has formed a lake but its size has not been determined. Many miles of passages have never been explored and new mysteries including the location of the lost burial ground of the Wyandotte Indians are expected to unfold as these passages are opened. Olentangy Indian Caverns afford a unique experience to the explorer interested in Indian lore and the awesome beauties of a natural wonderland. For the geology student, the fossils and various rock strata provide high educational value. For the tourist, a trip through the Caverns recreates the thrilling days of lost Indian tribes and pioneer explorers. 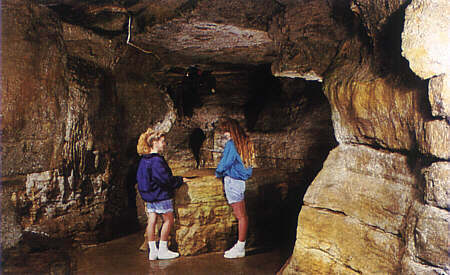 The caverns are naturally air conditioned, with year-round temperature a constant 54 degrees. The 30 minute tour is an event that you will long remember, so bring your camera and come see historic OLENTANGY INDIAN CAVERNS. 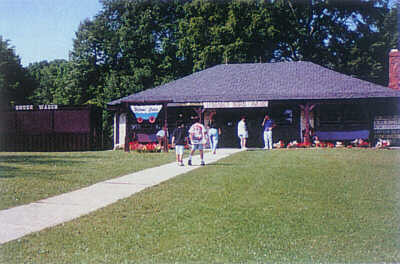 Facilities and activities available at OLENTANGY INDIAN CAVERNS AND OHIO FRONTIER LAND include: Cavern Tours, Indian Museum, Indian Goods Store, Gem Mining, Minigolf, playground, snack bar, softball, volleyball, and horseshoes. Nearby is boating and fishing in the Alum Creek Reservoir, O'Shaunessy Reservoir, Delaware Reservoir, and Hoover Reservoir. Within 10 minutes drive is the Columbus Zoo, Wyandot Lake Amusement/Water Park and the numerous antique shops of Powell. Located within 20 minutes is the Ohio State Fairgrounds, Ohio Historical Center, French Market and Ohio Railway Museum. 30 minutes away is downtown Columbus with German Village, Center of Science and Industry, and the State Capitol. Beautiful wooded picnic grounds, large shelter house, playground and outdoor cooking facilities have been provided for families, organizations, clubs, schools and churches to enjoy. 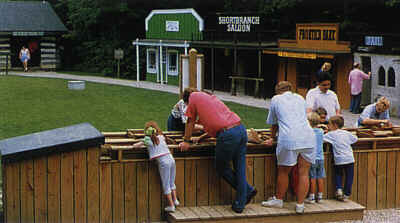 While you are here, you may also want to see "Ohio Frontier Land," a recreation of a Fort, a frontier town named "Liberty City," and "Indian Country." Learn about Frontier Life, see items from the past, and read the humorous epitaphs in the cemetery. You can also go GEM MINING. Select a bag of sandy mining rough, place part of the rough in a screen bottom box, and dip the box in the SLUICE shown above. Watch the gems appear as the sand washes away. During the HISTORIC Indian period of the 18th century OHIO was part of the Northwest territory, and until about 1795 was considered to be INDIAN COUNTRY. There were two basic Indian groups: the IROQUOIS cultural group, including the WYANDOTS, and the ALGONQUIN cultural group, including the Delaware, Miami and Shawnee nations. INDIAN COUNTRY has recreations of an IROQUOIS LONG HOUSE, Wigwam, and Teepees. HISTORIC plaques by Jim Baker show the ways of the Warriors, Indian life, the famous Indian Chiefs, and the history of the Indians in the OHIO FRONTIER LAND.